Native Dancer is a wonder of a record. 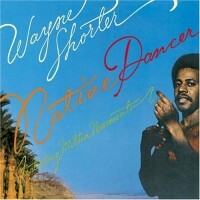 Wayne Shorter is the greatest (especially soprano) sax player in the history of Jazz, and here, he plays at his best. The music is not really Jazz. Instead, Brazilian star Milton Nascimento sings and adds his unique wizardry to the lush, tropical mood of the set. There’s not a trace of Bossa Nova in this music but Nascimento’s idiosyncratic handwriting instead. The compositions sound natural, though, and not as forcefully “intelligent” as the music Shorter would record after this. The musicians (what a lineup!) cook up a unique sound; no one tries to show off, it’s all mood and sensuality. It’s useless to pick out tunes – the flow is perfect, and so is this LP.